english name "Florida False Caesar"
The following description is based on the original description by Murrill (1948). The cap of A. spretella is 50 mm wide, gray, darker over the center, convex to broadly convex, slightly umbonate, smooth, viscid when moist, with striate margin (60% of the radius). Volval remnants are absent. The flesh is thin and white. The gills are crowded, narrow, adnexed, white, unchanging when damaged, with a smooth edge. The stem is 85 × 6 - 8 mm, slightly tapering upward, hollow, fibrillose, white above the ring, pale rosy-cream below. The ring is skirt-like, pure white, unchanging, and attached 25 mm below the top of the stem. The saccate volva is baggy, lobed, white, unchanging, membranous, not fragile, and 30 × 20 mm. 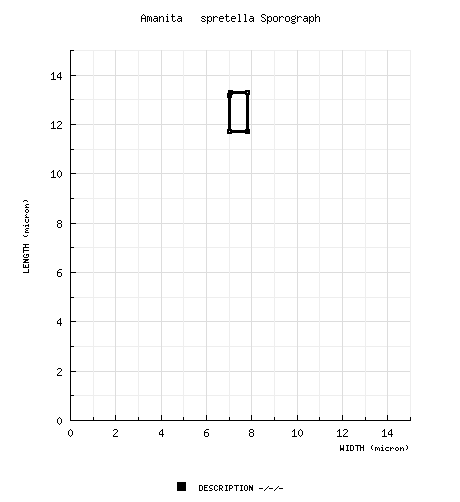 In his study of the type collection, Jenkins (1979) reported the following spore measurements: 11.7 - 13.3 × (6.7-) 7.0 - 7.8 µm. They are ellipsoid to elongate and inamyloid. discussion This species was originally described from a single specimen in northern Florida (Alachua County) in oak dominated upland in an otherwise wetland area. 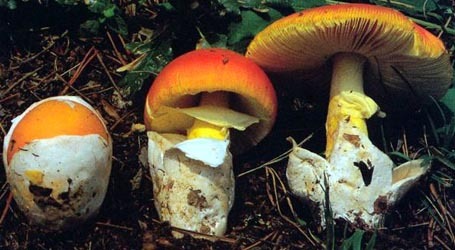 Murrill emphasizes among other things the delicate coloring of the stem and a possible relationship to Amanita spreta (Peck) Sacc. The general appearance of this species suggests it might be a member of Amanita stirps Hemibapha, however, that is not the case; neither is it related to Amanita spreta which is a member of stirps Caesarea. The present species cannot belong in either of these groups because the subhymenium is not cellular. With some hesitation, RET suggests the possibility of a relationship to A. calyptroderma Peck. At any rate we will use the phrase "False Caesar" in our proposed English name for this species. author (Murrill) Murrill. 1948. Lloydia 2(2): 105. ≡Venenarius spretellus Murrill. 1948. Lloydia 2(2): 105.
type studies Jenkins. (1979). Mycotaxon 10: ??. The following material not directly from the protolog of the present taxon and not cited as the work of Dr. Z. L. Yang or another researcher is based on original research by R. E. Tulloss. The following material is based on the protolog and the type study by Jenkins (cited above). pileus 50 mm wide, gray, darker on disc, convex to subexpanded, slightly umbonate, viscid; context white, thin; margin striate (0.6R), with entire edge; universal veil not described. lamellae adnexed, crowded, white, unchanging when cut or bruised, narrow, with entire edge; lamellulae not described. stipe 85 × 6 - 8 mm, white above, with lower half rosy cream, furfuraceous, slightly narrowing upward; context hollow; partial veil superior, fixed 25 mm from apex, entire, deflexed, pure white, unchanging; universal veil as saccate volva, white, unchanging, lobed, baggy, not fragile, 30 × 20 mm. From (Jenkins, 1979): [-/-/-] 11.7 - 13.3 × (6.7-) 7.0 - 7.8 μm, (Q = 1.50 - 1.88; Q' = 1.66), hyaline, thin-walled, inamyloid, ellipsoid to elongate, often adaxially flattened; apiculus sublateral, cylindric; contents guttulate; color in deposit unknown. ecology Solitary. In fairly good soil, at edge of high hammock. "Hammock" is a term used in Florida for relatively high land surrounded by a low, wet area. Hammocks have distinct vegetation (including large woody plants) in comparison to the surrounding, lower land. material examined from type study of Jenkins (1979): U. S. A.: FLORIDA— Alachua Co. - Gainesville, 19.viii.1948 W. A. Murrill F 40841 (holotype, FLAS). discussion Neither of the editors have examined the type of this rather briefly described species.